Lela beach is a few miles west of Honiara . We went there to view the remains of an American floating crane on the shore and two Japanese Type 38 (1905) 75 mm guns on the beach. (Thanks to Richard Vangampler for the exact identification) One of the villagers said they found them in a scrap dump and set them up there . It looked like both have had charges put down the barrels to wreck them. Across the road behind the village there is a Japanese memorial and behind that the remains of a Japanese tracked gun tractor that towed one of the 150mm guns used to shell Henderson Field. I an told a lot of other relics used to be here 25 years ago. One of the Japanese gunners had returned in 1995 and showed the villagers where the tractor had been buried during the retreat . The particular gun that he served on and that this tractor towed is now on display in Honiara in a park next to the National Museum. Apart from the 150mm gun near the museum there was another one down the road a bit at the Guadalcanal Tennis Club . 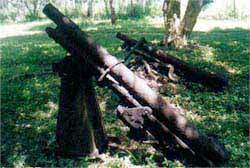 This gun was originally situated West of Honiara in a palm grove near the wreck of Transport Kyusyu Maru. The very best Japanese artillery piece we saw on the island was a very nice 95% complete 37mm AT gun (recovered from the Mount Austen battle area) . This was outside the Solomon Islands Tourist office next to the Kitano Mendana Hotel (this has since been moved across the road to the National Museum grounds).